When you look at the events taking place in the news today it is no wonder that so many people look to God in their prayers and ask, "When Lord, when is this going to happen?" Well the fact is that it has happened on a few occasions in history, when nations and the people that govern them are faithful to listen to God's word and heed it. I'd like to tell you about one such occasion. At the dawn of the 20th century two nations in South America were on the verge of war. At the centre of the dispute was the border between Chile and Argentina. One side felt the border should follow the watershed, the other favoured the ridge along the highest point in the range through the Andes mountains. In 1902, sabres rattled, and a resolution seemed unattainable. Two years earlier, half a world away in Rome, Pope Leo XIII had issued an encyclical which called for "the consecration of the entire world to Christ the Redeemer." Church leaders in the two countries, citing this admonishment of His Holiness, implored their governments to find a diplomatic solution. Both the Chilean and Argentinian governments agreed, sending the dispute to arbitration. The Northern end was arbitrated by an ambassador from the United States, while the southern end was arbitrated by King Edward VI of England. In 1903 the two nations came to an agreement. But that's just the Readers Digest(tm) version of the story. When Leo XII's encyclical was first issued, the bishop of Cuyo had promised to erect a statue of Christ the Redeemer to remind the parties of Christ's message of peace. The 7m-high bronze statue was commissioned from sculptor Mateo Alonso of Buenos Aires. As the the conflict between the two conutries heated up and the Christain leaders made their appeal for peace, Ángela Oliveira Cézar de Costa, a well-connected society lady and devote Christian, suggested taking the statue to the Andes in the event of peace as a symbol of unity between the two nations. A close friend of the the president of Argentina, she was able to influence the leadership of both countries. Because of her involvment in the peace process she would be nominated for a Nobel Peace Prize. In 1904 the statue was transported in pieces to a point in the Uspallata Pass, 13,00 feet above sea level. Mount Aconcagua forms its backdrop, lofting 13,000 feet higher. On the day of it's dedication 3,000 Chileans and Argentinians, including several bishops and the foreign ministers of both nations (the respective presidents were unable to attend), made the difficult journey to the statue's location at the highest readily accessible point on the boundary between the two nations. There are two plaques at its base. One reads "He is our peace who hath made us one." The other, placed there in 1937, declares: "Sooner shall these mountains crumble into dust than Argentines and Chileans break the peace sworn at the feet of Christ the Redeemer." It is testament, not just to a single agreement, but to a vow of eternal peace made by neighbours. In a world where ploughshares are more commonly beaten into swords it is a shining example to nations everywhere. 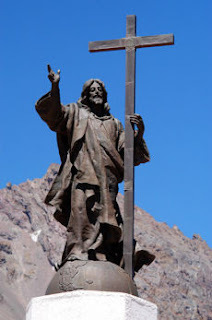 The statue "Christ in the Andes", cast from the bronze of two melted-down cannons, was dedicated on March 13th, 1904 --- 103 years ago this week. March 11, 1812 - Missionary William Carey's print shop in Serampore, India, is destroyed by fire. Also lost in the blaze is his massive polyglot (multi-language) dictionary, two grammar books, sets of type for 14 eastern languages, and whole versions of the Bible. Said Carey of the event, "The loss is heavy, but as traveling a road the second time is usually done with greater ease and certainty than the first time, so I trust the work will lose nothing of real value . . . We are cast down but not in despair." News of the fire catapulted Carey to fame, bringing in abundant funds and volunteer labor. March 12, 1088 - Odo of Lagery is elected pope and takes the name Urban II. Though he had some trouble taking his office (Holy Roman Emperor Henry IV supported an antipope, Clement III), he made a name for himself by proclaiming the first Crusade, in response to a request for help from Constantinople, in 1095. As it turns out Pope Urban completely misunderstood the request, as a result instead of rescuing Constantinople and Jerusalem, they were sacked, making the Pope's declaration "God wills it!" something of an "Urban myth." March 14, 1937 - Pope Pius XI issues an encyclical against the Nazi "cult": "Race, nation, state . . . all have an essential and honorable place within the secular order," he wrote. "To abstract them, however, from the earthly scale of values and make them the supreme norm of all values, including religious ones, and divinize them with an idolatrous cult, is to be guilty of perverting and falsifying the order of things created and commanded by God". March 15, 1517 - Needing money to rebuild St. Peter's basilica, Pope Leo X announces a special sale of indulgences. A Dominican named Johann Tetzel led the way in promoting the sale in Germany and erroneously declared that indulgences would cover future sins (Leo's forgave all past sins). The teaching angered monk Martin Luther, who soon posted his 95 Theses in response, eventually giving rise to the Reformation. March 16, 1649 - In Canada, Jesuit missionary, John of Brebeuf, is martyred by Iroquois at the end of a tribal war with the Huron with whom the Jesuit had been living for most of the last 23 years. March 17, 461 - (traditional date): Patrick, missionary to Ireland and that country's patron saint, dies. Irish raiders captured Patrick, a Romanized Briton, and enslaved him as a youth. He escaped to Gaul (modern France) but returned to Ireland after experiencing a vision calling him back to preach. Patrick enjoyed great success there as a missionary, and only the far south remained predominantly pagan when he died.